Started by the Suffragettes in the early 1900’s, the first International Women’s Day was celebrated in 1911. The theme of this year’s IWD is #PressForProgress – to help women and girls achieve their ambitions; challenge conscious and unconscious bias; call for gender-balanced leadership; value women and men’s contributions equally; and create inclusive flexible cultures. The World Economic Forum’s 2017 Global Gender Gap Report tells us that gender parity is over 200 years away, and that just isn’t good enough. Global activism for women’s equality has been fuelled by movements like #MeToo, #TimesUp and more. Now, more than ever, is the time to #PressforProgress. With that in mind, here are some recommendations for fiction and non-fiction reads for International Women’s Day! Chantelle from Oh The Stories recommends the Veronica Speedwell series by Deanna Raybourn. Amy Lord from Ten Penny Dreams recommends The Power by Naomi Alderman and Wide Sargrasso Sea by Jean Rhys. Becky from A Fool’s Ingenuity recommends All The Single Ladies by Rebecca Traister and How To Be A Woman by Caitlin Moran. 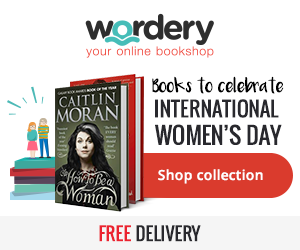 Check out Wordery’s picks with up to 33% off and FREE delivery! Do you have any recommendations to add to this list? Let me know in the comments, and I’ll add them in to make one super list of recommended reads! I wish I’d been organised enough to sort out a post for International Women’s Day. Love all the recs, though, I have read a few of your recs, all fiction, but I am interested in reading a few non-fiction books so I’ll definitely be checking out those recs.